Open Day Saturday 9th April 10 am to 6pm. We are delighted to invite you all to our very first open day this Saturday – 9th April. There will be reductions of up to 50% off selected fabrics, remnants on sale and of course an opportunity to see all our fabrics in real life. Refreshments and snacks will be offered to weary travellers ;). And there’s lots more a short drive away – Fore Abbey, Mullaghmeen Woods…. To find us – we are situated between Oldcastle and Kells on the R163, approx 1 km the Kells side of Ballinlough Village. If coming from M3 / N3, take the exist north of Kells at Drumbaragh. There are signposts for Oldcastle/Ballinlough and Loughcrew. We are about 3 miles from here and we will have big signs at our entrance. 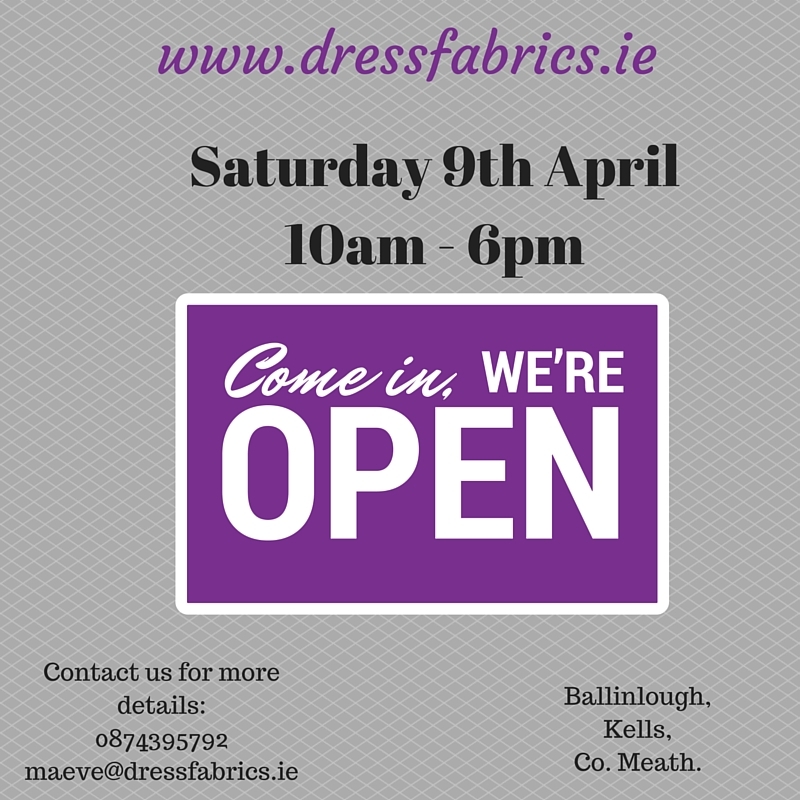 If you can’t make it this Saturday – you are always welcome to visit anytime by appointment, just contact us on by email – maeve@dressfabrics.ie or on 087 4395792.